Kenneth Campbell's life story - Chapter 5 - LFChistory - Stats galore for Liverpool FC! 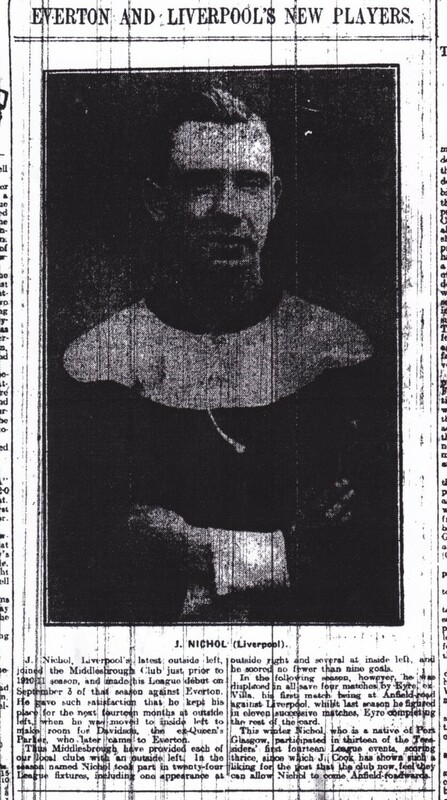 Scottish keeper, Kenny Campbell, told his life story in the Weekly News in May and June of 1921. He made 142 apperances for Liverpool from 1912-1920. In the first chapter he had just left Scotland for Liverpool. In the last chapter Tom Fairfoul and Kenny Campbell were in trouble ahead of the FA Cup semi-final against Aston Villa in 1914. Leads to victory against the Villa. Last week exigencies of space compelled me to leave myself and Bob Pursell in a rather awkward predicament. No doubt, most of you will have guessed who the couple were that greeted us on the front step. But it’s ten to one you’ve guessed it wrong. It wasn’t Tom Watson and Bill Connell – it was clubmates Tommy Fairfoull and Jimmy Nicholl! They, too, had stolen out for a breather, and landed, like us, in a mess. They informed us that the front door, like the one at the back, was locked. It meant that we had to knock for admittance, and we had a good idea what that meant. If you could have seen us four standing in that hotel porch trying to screw up courage to knock you would have seen a picture. None of us cared for the job of going in first, but after a bit of arguing as to the best way to face the music, Tommy Fairfoull spoke up like a man and declared he would go first. I had often admired Tommy and his dare-devil methods previous to this (and many times later on, let me add), but at that particular moment he was a hero in my eyes. So up goes our right half and bangs on the door. It was opened immediately, no doubt those inside were at the back of the door and heard all our conversation, and Tommy walked in, followed by the other three. And there on either side of the passage were the persons we most dreaded – Tom Watson, the manager, and old Bill, the trainer! “Where have you been?” demanded our manager. We muttered something in the way of an excuse, but I could see the glint in Mr. Watson’s eye that he was for no excuses. It was a crestfallen quartette that wandered up the stairs. To be suspended on the eve of our semi-final! It was awful. Still, there was nothing for it but to obey. We knew Mr. Watson so well that we knew he meant every word of what he had said. Ruefully, Tommy and I packed our bags in preparation for our return next morning. Of course all the rest of the boys had been in bed when we got home, but the news was not long in spreading, and when we came down for breakfast we had to run the gauntlet of most unmerciful chaff. Now the hanging about in the cold night air with slippers on and no hat or cap had landed me in for a very sore throat, and I was as hoarse as a cow in the morning. Whether my clubmates knew this I cannot say, but they insisted on talking to me when I was only too anxious not to let our club officials know I had throat trouble. I got out of the difficulty by simply nodding my head or shaking it as the answer was yes or no, but it was a great trial to me until breakfast was over and the hot food slackened my throat. And we didn’t go home after all. Communication over the ‘phone with Liverpool was opened, but what was said we did not get to know. All we knew was that we were told to remain where we were, and to put ourselves under the order of the trainer for the rest of the trip, which we did, as you will readily understand. Now, with regard to our match with the Villa there could be no doubt which was the favourite for the final. Indeed, it was well known to us that hundreds of Birmingham people (Aston Villa supporters) had booked special trains for Crystal Palace, where the final was to be played. The London press was pretty severe on us. It was a case something similar to Partick Thistle’s meeting with Rangers in this year’s Scottish final. The odds were umpteen to nothing against us. However, our boys thought that the Villa would have to play ninety minutes before they entered the final. This optimism helped us greatly. If a team goes into the field under the impression that it is beaten then it is bound to happen. On the other hand, a team which has mde up its mind it is not to lose takes some whacking. The great day arrived. How well do I remember the excitement. Few of us will forget the speech “Old Tom” Watson (as he was affectionately called amongst the boys) made at lunch before leaving for Tottenham. The continual slighting of his team by the press had go on his nerves. He got up after lunch to make a speech, and during all the years I had known him I do not remember ever having seen him so agitated. He was red in the face when he finished, and banged his fist on the table setting everything jumping. His speech did more than anything else to brace us up. He was a general favourite, and we players would have done anything for him. Why? Because he was all a manager should be – a father to the players, a man you could go to with any worry or trouble. I do not think a better manager ever lived. Our hearts warmed a bit when we reached the ground at White Hart Lane and found a goodly crowd of our supporters all the way from Liverpool wearing the club colours. It bucked us up considerably to know we were not exactly neglected. Going on to the ground to have a look before starting to strip I ran across our old clubmates, Harrop and Sam Hardy, who were then with the Villa. “Oh, we’ve a sporting chance,” I retorted. He said no more, but turned away with a sarcastic smile. I felt then as Tom Watson did, and thought I should just like to see Harrop’s face IF we did win. Sam Hardy, in his usual quiet manner, remarked – “Hope it’s a good game, Kenny” – that was all. The teams were: – Aston Villa – Hardy; Lyon and Weston, Barber, Harrop, and Leach; Wallace, Stephenson, Hampton, Bache, and Edgley. Liverpool – myself; Longworth and Pursell; Fairfoull, Lowe, and Ferguson; Sheldon, Metcalf, Miller, Lacey, and Nicholl. The referee was Mr. H.S. Bamlett of Oldham, but who, I understand, has left the Lancashire club recently. It was a stirring encounter, I can tell you. What with Bache being in great shooting form and Harry Hampton ever ready to pounce on a chance, I had a hot time of it. For the first twenty minutes the Villa were (in football parlance) all over us, but, ably assisted by Longworth and Bob Pursell, I was able to keep our goal intact. Then our boys got a look in, and Jimmy Nicholl, the old Cambuslang Rangers, surprised Hardy by heading a goal. Shortly after half-time the same player struck the bar, with Hardy beaten, and our boys claimed that the ball had rebounded over the goal-line. The referee decided against us, but afterwards Sam admitted that he thought he ball was over. However, Nicholl got another goal, and our chances looked extremely rosy for the Royal Final. We knew the King was going to witness the final and to present the medals. Excitement was intense right through, but our boys stuck it to the end. Liverpool's hero on the day - Jimmy Nicholl! There was one incident I must recall. Wallace, the outside right of the Villa – he has, I notice, been transferred to Oldham – came right through our defence, and shot straight at me from close range. I put up my hands, but I was too late – the ball struck me fair on the nose and curled round for a corner. Of course, all the papers came away with the story of “Campbell’s great save from Wallace at close range,” but my swollen nose bore testimony to the fact that the “save” was none of my seeking. It is history now that we held the much fancied team till the finish, and won our right to the final by two goals scored by a village-mate of mine, Jimmy Nicholl. Sam Hardy was the only one of the defeated team to come into our dressing-room to congratulate us. I did not see my friend Harrop to return his smile. I suppose he would be feeling pretty sore about it. We didn’t stay long in London after the game. It was a rush away to catch a train for Liverpool, and after a very happy journey we reached Lime Street Station well on in the evening. What a reception we got. The place was swarming, and the players were cheered to the echo. It was a great finish for the “nobodys” who had left the seaport but a short time previously. It is worth while noting that the Liverpool team contained six Scots – Bob Pursell (late Queen’s Park), Fairfoull and Ferguson (late Third Lanark), Tom Miller (Hamilton Acas), Jimmy Nicholl (Cambuslang Rangers and Middlesbrough), and myself; one Irishman, the ever smiling “Billy” Lacey; and four Englishmen – Longworth, Sheldon, Metcalf, and Lowe. And now we got into training for the final, when I spent the rottenest ten minutes in the whole course of my life. Next week – The story of the final v. Burnley.